We propose a new combination of an anionic (potassium oleate) and cationic (n-octylpyridinium chloride) surfactants that are able to self-assemble into long cylindrical (wormlike) mixed micelles in water. The solutions have strong viscoelastic properties with viscosity up to 300 Pa·s and elastic modulus around 20 Pa, which are attributed to the formation of an entangled micellar network. 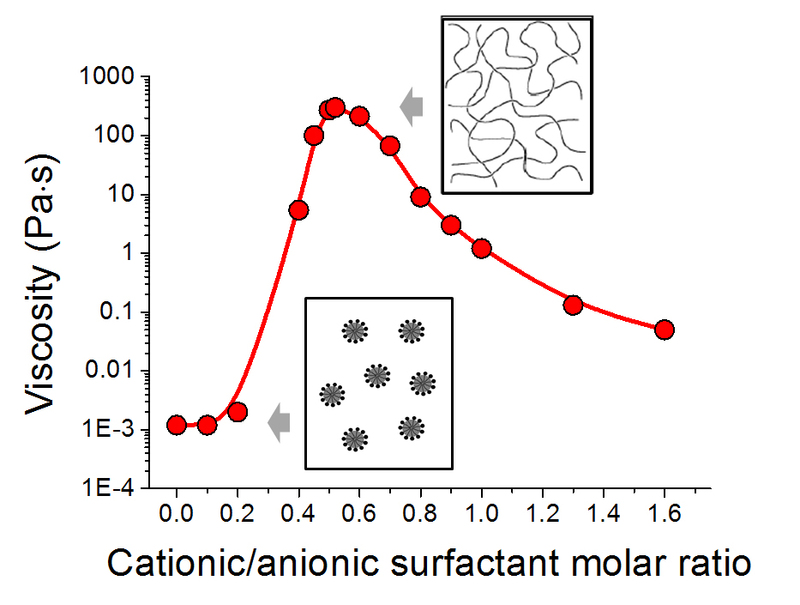 We discover that with an increase in the molar ratio of cationic to anionic surfactant, the solutions first increase drastically their viscosity and elasticity due to the growth of micelles in length and formation of the network, but then the rheological parameters slightly decrease, possibly due to micellar branching or shortening. The addition of cationic surfactant also induces the increase of difference between scission energy and micellar electrostatic energy, which is explained both by stronger binding of surfactants within the micelle and decrease of the micellar net charge. Keywords: surfactant, self-assembly, wormlike micelles, rheology, viscoelastic properties.